It has been a while that I searched for a good crunchy health bar. I had several recipes but it wasn’t exactly what I was looking for. I had 2 recipes & I made it into this one. I love to eat them & they are just about right. I didn’t add any dried fruits because I hadn’t any in the house. 1. Preheat the oven to 175°C ( 347 F ) for 15 minutes. 2. Take a large roasting tin about 20 X 30 cm. With the help of some kitchen paper, smear the bottom of the tin all over with baking margarine. Lay & large piece of parchment paper in it, with the sides overhanging the tin. This is necessary & easy, for later, to pull out the baked bars after they have baked into the oven. 3. Take a bowl & place the oats, pumpkin seeds, flax seeds, sugar, baking powder & the grinned almonds together. Mix well with a spoon. 4. Now, add milk, agave syrup & canola oil. Mix it all well trough with a spoon so that the liquid is well spread around the oats, etc. Mix it for a minute or 2. 5. Spread the mixture evenly with the back of a spoon in 1 layer into the parchment paper into the large tin. You can make a thicker layer too. 6. Place into the preheated oven & bake for about 25 to 35 minutes until the mixture has baked , the liquids are gone & the top is golden brown in colour. In my case, it took 25 minutes. 7. Turn the oven off, but leave the tin in the oven, to rest with the door closed for 30 minutes. 8. Now, take the tin out of the oven. Take the mix out with the help of your parchment paper on 2 sides of the tin. Carefully, lift it of the parchment paper & place on a wire rack to cool off. 9. When cool, transfer on a chopping board & cut into equal sized bars. It is easier to cut the bars when you oil your cutting knife. Enjoy as breakfast, brunch or as a snack. Lovely with a good cup of coffee or some good tea.♥ Stay Tuned & subscribe by email! Join 1,800 email subscribers now!!! It is free!!!! Click the link here below to subscribe!!! MMMMMM,…Sophie!! These crunchy bars look divine! !I would like to eat 2 of them now with my morning coffee, thanks! its a really healthy snack and looks yummy. These look like my kinda food Sophie! & I must say thank you to you for your lovely comments on our Anniversary…34 yrs lol! 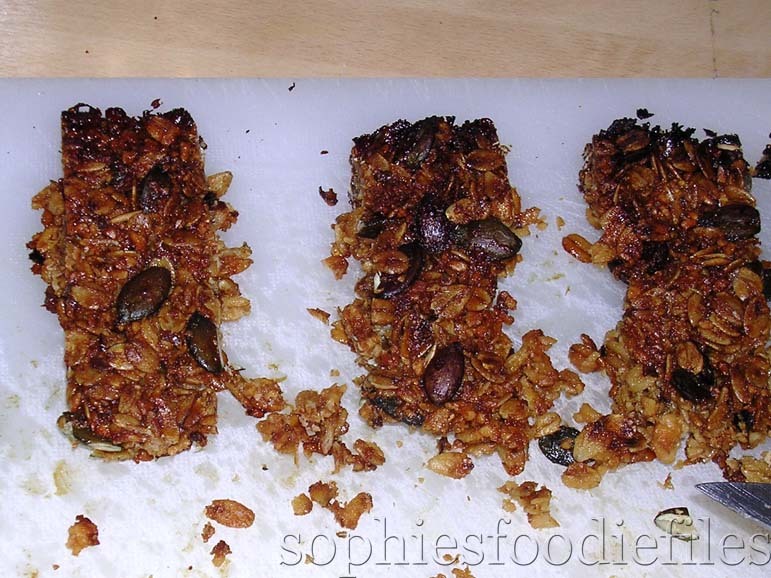 Sophie, this bars look enticing and crunchy and healthy. I think it's what I need right now even after dinner. These look great–I'm going to make them for my daughter's school snacks. Thanks. Love the flavors in these tasty bars. They look great. Commercial health bars tend to taste like cardboard, but homemade are generally pretty wonderful. I bet these are delicious! Mmm! I love oats! And I like very much pumpkin seeds mixed with agave syrup or maple syrup, they look good! What a great recipe. I think I must make these soon. What a great recipe!!! Crunchy and delicious! I love snacks like this. Not too sweet and packed with healthy goodness! Wow, way better than store bought. Healthy and delicious! I just ate breakfast but now I want some of your crunchy bars. Sophie these look totally awesome!!!! So yummy!! !I posted about your package and my package to you is in the mail! Should be there in a few days!!!! I always tell myself I should make some healthy bars like this, but I rarely get around to it. These look great! What great crunchy snack bars! And so healthy too, they look great Sophie! These look delicious Sophie! A perfect and healthy snack for me to take to class in the evenings!! Sophie, I think I can smell them…I love it!! These look so good! Love the pumpkin seeds and oats. Yummy and healthy! I would love one of these with my coffee.. They sound terrific!! Couple more weeks and I will see pumpkins everywhere. Can't freaking wait!! Actually surprises me it will take that long since how mild our summer has been.Heck I buy pumpkins not for carving because that takes a ton of coordination but rather for the seeds.Nicely done! Looks great! I have been meaning to make my own energy/granola bars for a while now. This recipe sounds so tasty and good for you too, what more could you ask for – cannot wait to give it a try. @ all of my foodie friends: Thanks a lot, give them a try!! They are absolutely fabulous, I think! Needed to send you one little bit of observation to finally thank you as before over the precious advice you have featured on this site. It’s simply unbelievably open-handed with people like you in giving extensively exactly what many of us would have distributed for an e-book to get some bucks for their own end, and in particular considering the fact that you might well have done it in case you wanted. These pointers as well worked to become great way to understand that many people have the same dreams just like my personal own to see very much more related to this matter. I am certain there are a lot more fun opportunities in the future for many who read through your blog. Hi, i feel that i noticed you visited my web site thus i got here to “go back the choose”.I am trying to to find things to improve my web site!I suppose its adequate to make use of some of your ideas!! Howdy very cool blog!! Guy .. Beautiful .. Superb .. I’ll bookmark your website and take the feeds additionally…I’m happy to search out numerous helpful info right here within the post, we want work out extra strategies on this regard, thanks for sharing. I have learn several just right stuff here. Definitely worth bookmarking for revisiting. I wonder how much attempt you set to create this kind of excellent informative site. Normally I do not read article on blogs, but I wish to say that this write-up very forced me to take a look at and do it! Your writing style has been surprised me. Thank you, quite great article. You have observed very interesting details ! ps decent website . “O human race born to fly upward, wherefore at a little wind dost thou fall.” by Dante Alighieri. I always was concerned in this subject and stock still am, thank you for putting up. Simply wanna input on few general things, The website pattern is perfect, the written content is very wonderful : D.
I will right away grasp your rss feed as I can not in finding your e-mail subscription hyperlink or e-newsletter service. Do you’ve any? Please let me know in order that I could subscribe. Thanks. Magnificent web site. A lot of useful info here. I’m sending it to several friends ans also sharing in delicious. And naturally, thank you for your sweat! you’re in reality a excellent webmaster. The site loading velocity is amazing. It seems that you are doing any unique trick. Furthermore, The contents are masterwork. you have performed a excellent process in this topic! Rattling nice layout and good subject matter, nothing at all else we want : D.
Its fantastic as your other posts : D, regards for putting up. “You can’t have everything. Where would you put it” by Steven Wright. Keep up the fantastic work, I read few content on this internet site and I conceive that your site is real interesting and holds circles of excellent information. An interesting discussion is worth comment. I think that you should write more on this topic, it might not be a taboo subject but generally people are not enough to speak on such topics. Hello there I am so excited I found your webpage, I really found you by mistake, while I was browsing on Aol for something else, Nonetheless I am here now and would just like to say thanks for a marvelous post and a all round enjoyable blog (I also love the theme/design), I don’t have time to read through it all at the moment but I have bookmarked it and also added in your RSS feeds, so when I have time I will be back to read a lot more, Please do keep up the superb work. of course like your website however you need to test the spelling on several of your posts. A number of them are rife with spelling problems and I find it very bothersome to tell the reality then again I will certainly come again again. This web site is known as a stroll-by for the entire information you needed about this and didn’t know who to ask. Glimpse right here, and also you’ll definitely uncover it. I used to be more than happy to search out this internet-site.I needed to thanks in your time for this excellent read!! I positively having fun with every little bit of it and I’ve you bookmarked to take a look at new stuff you weblog post. 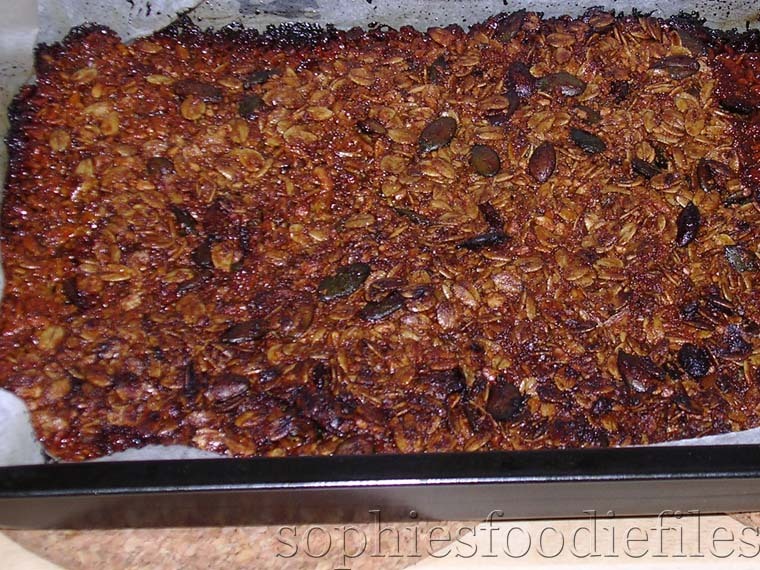 Hi, my name is Petra Brofft and I need to state that ” Crunchy oats, almonds & pumpkin seeds bars Sophies Foodie Files ” is actually an awesome write-up. Some truly good info , Glad I found this. “Always be ready to speak your mind and a base man will avoid you.” by William Blake.